The Project Eternity PayPal donation period will be ending next week on Monday, December 3rd at 6:00PM PST. After December 3rd current backers can add shipping and handling costs at our backer fulfillment site (coming soon). At the backer site, you will be able to select your add-ons and fill out your shipping address, so make sure you keep an eye out for the email that explains how to use the backer site. As a reminder we will let you know when the emails go out in a future update. The narrative team is creating the world almanac which contains all the information about the people and history of Project Eternity. Right now they are fleshing out the pantheon of gods. Do you have any crazy or wacky ideas for gods? Share your ideas in the forums! The artists and programmers have been working on character customization. The system allows for individual pieces of armor to show up on your characters such as boots, gloves, and chest armor. When you swap armor, the character's torso model and texture are also swapped out. There are thousands of different armor, weapon, head, and hair customization models for each race (male and female too! ), and we need to make sure that the system can organize and manage all of these character assets. Lastly, the picture is from an early test environment area using temporary art assets. 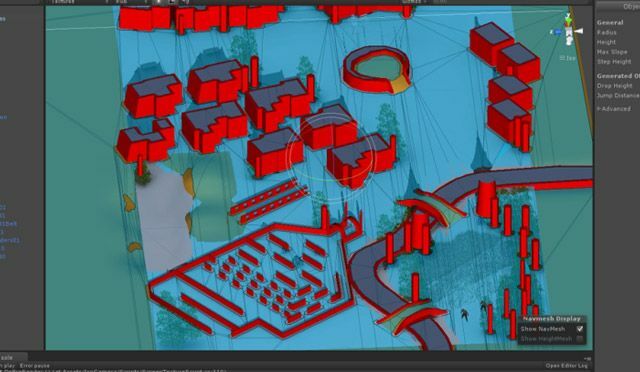 The red shapes represent collision geometry that will block pathfinding and line-of-sight. The light blue/greenish color represents the walkmesh geometry which determines where characters can walk. We use this area to test tech features that we are building. For example, we are using the cemetery in the lower left to test out complex party pathfinding. If you look carefully, you can see two test characters in the picture.